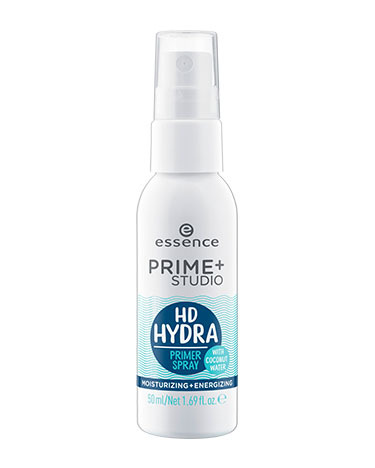 HD HYDRA primer spray has a rating of 4.4 stars based on 7 reviews. Hydration Station! The essence prime+studio HD hydra primer spray is a weightless coconut water-infused mist that primes, sets and refreshes makeup. Keeping your skin keep skin hydrated while visibly reducing the appearance of pores. no animal testing. Vegan. Paraben Free. INGREDIENTS: AQUA (WATER), GLYCERIN, COCOS NUCIFERA (COCONUT) WATER, METHYLPROPANEDIOL, ALCOHOL DENAT., BETAINE, AQUA (SWISS THERMAL SPRING WATER), PANTHENOL, PEG-40 HYDROGENATED CASTOR OIL, ACRYLATES COPOLYMER, ETHYLHEXYLGLYCERIN, COCOS NUCIFERA (COCONUT) FRUIT JUICE, SODIUM HYDROXIDE, CITRIC ACID, PHENOXYETHANOL, POTASSIUM SORBATE, SODIUM BENZOATE, PARFUM (FRAGRANCE).